to acknowledge the unfair and often inhumane treatment of Indigenous Australians throughout history. 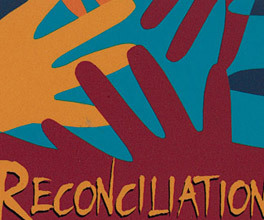 In 1997, Australia took a huge step towards these goals with the Australian Reconciliation Convention, a forum for Australians to gather and discuss Indigenous issues. Almost 1800 people attended, including lawyers, teachers, health workers, religious leaders, government officials and students all of whom had participated in meetings across the country in the year prior to the Convention. In facing the realities of the past, [...] we must not join those who would portray Australia's history since 1788 as little more than a disgraceful record of imperialism [...] such an approach will be repudiated by the overwhelming majority of Australians who are proud of what this country has achieved although inevitably acknowledging the blemishes in its past history. The Hon John Howard MP, 1997, 'Opening address by the Prime Minister', Australian Reconciliation Conference, viewed April 2011, <http://www.austlii.edu.au/au/other/IndigLRes/car/1997/4/pmspoken.html>. Many Australians interpreted John Howard's use of the word 'blemish' as undermining the significance of years of conflict between Indigenous and non-Indigenous Australians. By referring to the plight of Australia's Indigenous people as a mere ‘blemish', Howard dismissed centuries of dispossession and violence as insignificant. Indigenous delegates in the audience stood and turned their backs on the Prime Minister in protest. In spite of this controversy, the Convention was a great sucess. Workshops and discussions led to an atmosphere of understanding, healing and emotional exchange between Indigenous and non-Indigenous people. The Convention succeeded in bringing the issue of reconciliation into the national consciousness, and Howard's words couldn't stop delegates working toward, and hoping for, a better future. As European settlement took its toll on Indigenous communities, Aboriginal leaders fought tirelessly for land of their own. At a time when Aboriginal culture and traditions were under threat, art helped tell the story of Victoria's Indigenous people.